A nanny goat and her kids near a popular campsite in Olympic National Park. The National Park Service wants to move goats to the North Cascades, where they are a native species. 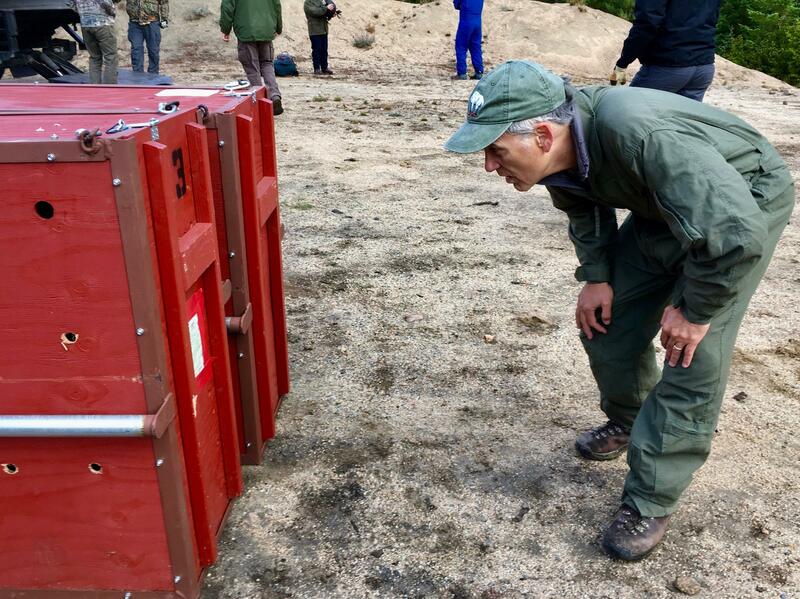 A crated and sedated mountain goat waits for release. It has been transported from Olympic National Park to a new home in the North Cascades. Professor David Wallin of Western Washington University has been studying mountain goats in the North Cascades for years. He's looking at a crate containing a goat ready for transport via helicopter. A 300-pound billy goat takes to the air, by crate, bound for its new home in the North Cascades. The National Park Service has embarked on a three- to five-year plan, in collaboration with the Washington Department of Fish and Wildlife and the National Forest Service, to remove all mountain goats from Olympic National Park in Washington state. As part of that plan, more than 75 mountain goats arrived in Washington's North Cascade mountains by refrigerated truck — to keep the goats cool — in recent weeks, before they were transferred to helicopters for the ride of their lives. The mountain goats came from Olympic National Park, where they are a non-native species that has wreaked havoc on the fragile alpine ecosystem and harassed hikers. The goats crave salt and enzymes found in human sweat and urine and some have come to see humans as delicious, walking salt licks. A male mountain goat killed a hiker in Olympic National Park in 2010. Roughly half of the 700 goats in the park will be relocated to the North Cascade mountains, where the goats are a native species. The rest will be killed. The Park Service will only be relocating goats captured in the most remote parts of Olympic National Park, where they have not become habituated to humans. Mountain goats are native to the North Cascade mountains, though the population has been declining since the mid-1900s and experts aren't sure why. Ruth Milner has been studying mountain goats in the North Cascades with the Washington Department of Fish and Wildlife since the 1990s. She said relocating goats from the Olympic Peninsula to the North Cascades is a win-win. 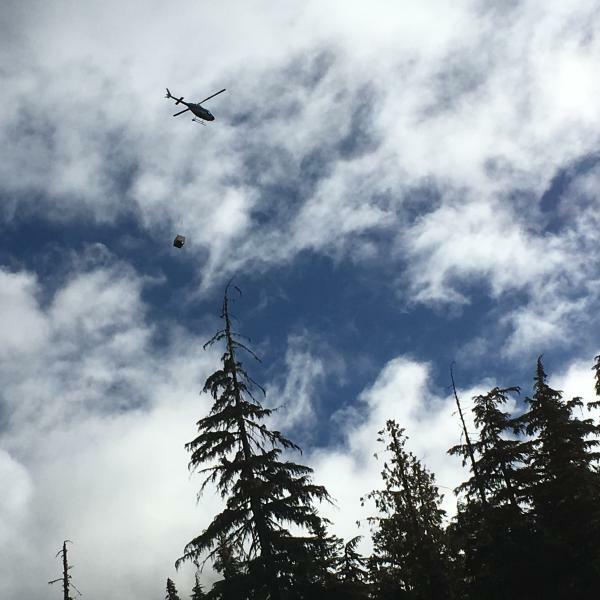 "It's kind of the perfect storm of their [Olympic National Park's] need to remove goats and our need to have goats returning to the Cascades," Milner said. The population of mountain goats in the North Cascades now hovers at roughly 3,000, down from a recorded high of 10,000 goats. "This translocation effort isn't going to solve the problem," said David Wallin, a professor in the environmental sciences department at Western Washington University. "But we figure we can move 300 to 400 goats over and that's a 10 percent bump in the population [in the North Cascades]. Our hope is that will help jump start the recovery." The infusion of goats will boost the genetic diversity of the dwindling North Cascades population. This is not the first time the Park Service has attempted to get rid of the mountain goats in Olympic National Park. In the 1980s several hundred goats were captured and relocated across the West, with limited success. But wildlife managers saw improvements within the Olympic National Park after the relocation. "We saw the ecosystem bounce back," said Patti Happe, a wildlife biologist at the park. "When you get a group of goats hanging out in an area they move around and trample the soil and fragile vegetation. Goats have this habit that they like to dust bathe. They form these wallows and create big patches of exposed soil, and with erosion they get bigger and bigger." But not all the goats were removed at the time. Since then the population has rebounded, and continues to rise at a rate of 8 percent per year. "We know where it's headed and we want to act now," Happe said. "I've been working on this project for a very long time. It's time to resolve this. The more we wait, the more goats we're gonna have to deal with." So far this fall, more than 75 goats have been captured in Olympic National Park and delivered to sites across the North Cascades. Three more goat capture and relocation events are planned for 2018 and 2019. The relocated mountain goats were fitted with radio collars and tagged so that their movements can be monitored in the coming years as they spread out and explore their new habitat. Now a story about mountain goats riding in helicopters - yeah. It's happening in Washington state. Wildlife officials are capturing wild mountain goats in Olympic National Park and moving them more than a hundred miles inland to the Cascade Mountains. Reporter Ashley Ahearn explains. ASHLEY AHEARN, BYLINE: The mountain goats actually arrived at a staging area in the North Cascades in a refrigerated truck, not a helicopter. That part's next. The truck kept the goats cool on their journey across half of Washington state. RICH HARRIS: Obviously, it's stressful for them. There's no getting around that. So we do everything we can to make that least stressful as possible. AHEARN: Rich Harris is a biologist who's overseeing the mountain goat relocation for the state Department of Fish and Wildlife. HARRIS: The fridge truck is part of it - keeping them cool - because the most dangerous thing for an animal being transferred and being stressed is overheating. AHEARN: Today, he and his team are going to release 14 goats into their new home in the North Cascades by helicopter. Another way to keep the goats from stressing out on this crazy trip - drugs. HARRIS: The goats were also given a long-lasting sedative. It's not a tranquilizer, doesn't put them out. It's called haloperidol. It kind of makes - all is good. That calms them down some. AHEARN: Each goat has its own crate. There are nanny goats and kids and one huge billy goat. I walk over to his crate and peer in at a wall of fluffy white muscle - more than 300 pounds of it. Whoa, you're a big guy. The goat stares back at me silently. Harris said he's one of the biggest billy goats they've ever caught. It took eight volunteers to lift him into the truck. 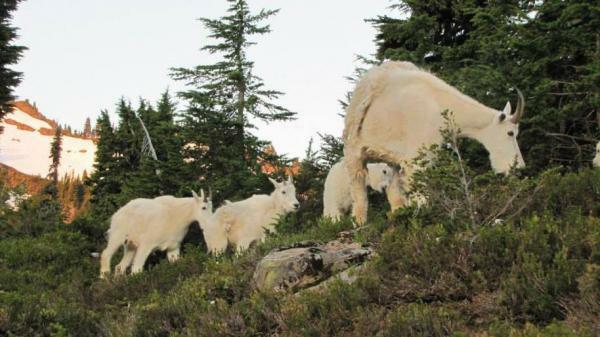 The National Park Service wants all mountain goats out of Olympic National Park. The goats are not native to the park. A dozen or so were released in the 1920s, and now there are roughly 700 of them, and they wreak havoc on fragile alpine ecosystems - munching flowers and creating what are called wallows, or muddy, dusty spots where the goats roll around. David Wallin is a professor at Western Washington University who's been studying mountain goats for years. This isn't the first time the Park Service has tried to get rid of the goats. Half of them were removed in the '80s. DAVID WALLIN: It got to the point where they got the ones that were easy to get. And then logistically, it was just getting difficult, and it was getting dangerous for the people who were doing the trapping, so they discontinued. AHEARN: And the remaining goats made baby goats, and then more baby goats. And the population came back and got used to having tourists around. See, goats love salt. And some goats in the park came to see hikers, with their sweaty gear and urine, sort of like walking salt licks. They lost their fear of humans. And that became a problem a few years ago when a goat killed a hiker in the park. So the Park Service is going to relocate half their goats to the North Cascades and kill the rest. But they're only relocating the ones who aren't used to humans. Wallin says the relocation program has been years in the making, and it's much-needed. The population of goats here in the North Cascades, where they are native, has dropped over the years. WALLIN: This translocation effort isn't going to solve the problem, but our hope is that that will help to jump-start the recovery. AHEARN: This must be a pretty exciting day for you. WALLIN: Oh, yeah. It's very exciting. Yeah. We've been working on this two or three years to get to this point. AHEARN: I think I hear a helicopter. AHEARN: A blue and white helicopter lands, and the team of volunteers attaches a long cable to the top of the billy goat's crate. AHEARN: That's a big animal. And then the helicopter rises up into the air and heads over the cliffs, where there's another team waiting to release the billy goat into his new digs. And he'll be sporting a snazzy new radio collar so they can track his movements once they do. 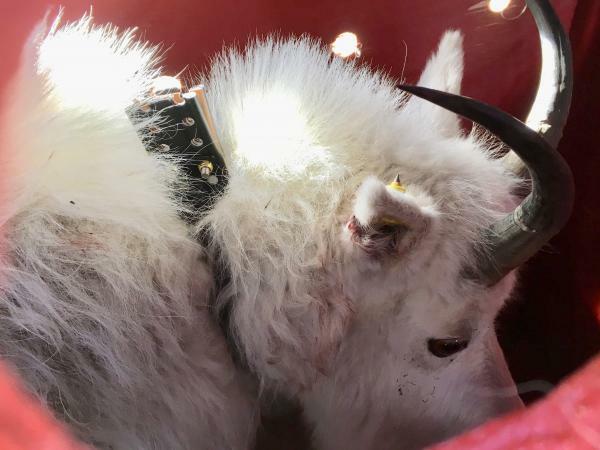 AHEARN: After the billy goat, the helicopter makes several more trips, delivering the rest of the goats two-by-two, nannies and kids, to their new home. For NPR News, I'm Ashley Ahearn in Washington's North Cascade Mountains.